Weight of Truck, Fuel, Chassis, Container and Cargo. Cannot Exceed 80,000lbs in Texas. Carrier’s can purchase a 2060/1547 permit from the State of Texas in order to increase the legal gross weight limit by 5% over legal gross and 10% over legal axle. This permit is only good on State highways and must be done annually on a truck by truck basis. It is not good on Interstate highways and just because a truck line shows you one does not mean their entire fleet is permitted. Clarification on this point will reduce your exposure. Maximum legal gross weight assumes the bridge (see below definition) is sufficient to support 80,000lbs. Depending on the equipment, the maximum weight limit may not reach 80,000lbs. A standard 20’ chassis hooked to a conventional tractor will not qualify for 80,000lbs. because the bridge is not sufficient. Hence, the need to run slider tandem and tri-axle equipment to handle heavy loads. If a load is overweight, you can buy a permit. In Texas, there is no way to permit a divisible load outside of the 2060/1547 permit noted above. If the load is divisible, you must break it down at a port facility or the cargo is going to move illegally. If the cargo is not divisible, you can purchase a single trip permit on a load by load basis. An example of cargo that would be approved for a single trip permit would be a large piece of machinery that could not be broken down. The distance from the center of the steering axle of the truck to the center of the last chassis/trailer axle. The distance between the first drive axle to the center of the last trailer axle. Bridge laws are in place to displace wear and tear on our highways by ensuring proper load distribution. Note: TXDOT provides a Permissible Weight Table listing on their web site. This chart will break down the bridge distance in feet and associated allowed tolerances. Load limit determined by the manufacturer. Tire rating is added to the inner bridge limit to help determine gross weight. 17,000lbs. - 19,500lbs. The vast majority of owner operators operate used conventional trucks, which allow them to handle both local and over-the-road deliveries. The axle groupings and distance between them determine maximum permissible axle weight. See limits listed under ‘maximum axle weight’. The carrier selection process is paramount to ensuring you have the least amount of risk and can transport the most amount of cargo legally. There is no doubt that large shippers benefit greatly by contracting directly with qualified transportation providers who operate the necessary equipment to handle heavy loads along with the associated permits. It is no secret that steamship lines have limited access to specialized chassis such as spread and tri-axle chassis. Also, in order to maximize your potential savings on a local basis, transportation providers must have current 2060/1547 permits on each of their trucks. This permit is carried in the cab of the truck and is to be provided to officers upon inspection. We recommend you ask for copies of this permit on several different units to ensure the provider has not simply purchased one permit and is using it as a catch all for their entire fleet. 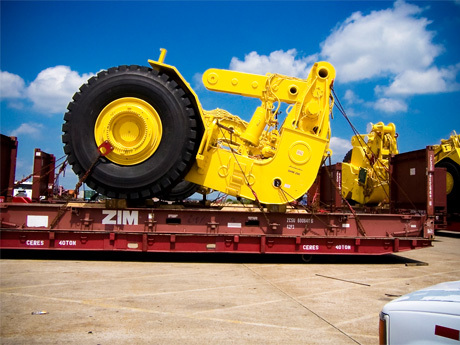 By ensuring your transportation provider operates the proper equipment to handle overweight loads, you can eliminate the steamship lines chassis usage fee, maximize cargo weight and save on ocean freight costs. This is a guide and in no way supersedes State or Federal law.